I got a nice review from Choice Magazine regarding my study of Mira Nair. Her latest film, The Namesake just opened in limited release in several parts of the country this week. Here's what CHOICE had to say: "...Muir (who has written numerous books on film) demonstrates that his subject is worthy of attention. Muir likes to deal with filmmakers whose work is independent and uncompromised - specifically, with what he calls "singularity," the control of an auteur. Muir calls Nair the spiritual heir to Satyajit Ray, the first great Indian filmmaker. Nair's work tends to depict the struggles of clashing cultures; as Muir puts it, Nair seeks a national versus personal identity, "her own personal India." 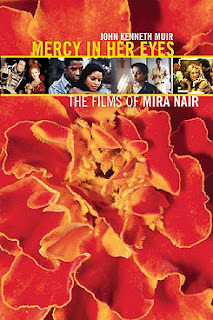 Muir's discussion is chronological, and each chapter deals with one or more of Nair's works, from her first feature-length film, Salaam Bombay (1988), to her most curent, The Namesake (2006). The chapter on Bombay takes the reader on a step-by-step journey through scripting, financing, and casting to the actual 60-day shooting schedule. Muir avails himself of interviews, articles and Internet blogs, and his coverage is thorough. The first full-length study of Nair, the book includes an extensive bibliography (which lists reviews, periodical appreciations, interviews and blogs), endnotes, and stunning color reproductions from the films. Summing Up: highly recommended." Woo-hoo! An Indian reporter, Amit Sengupta also did a "global sketch" on me and Mercy in Her Eyes for the Saturday edition of the Kolkata Times , but alas there's no Internet edition, so I can't link to it here. D'oh. It's a nice piece...got a picture of me and everything!